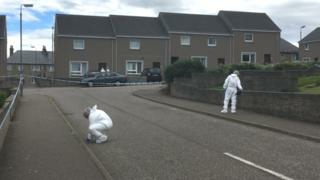 Police have launched a murder investigation after the body of a man was found at a house in Fraserburgh. Gary Clampett, 39, was pronounced dead at the property in Fernie Place, following a "large-scale disturbance" at about 04:00. Police said inquiries were at an early stage and appealed for anyone with information to contact them. Det Insp Gary Winter said: "We are following a number of lines of inquiry." He added that police would remain in the area while inquiries were ongoing. "I would appeal to anyone with any information in relation to this incident or private CCTV in the area of Fernie Place, Fraserburgh, to please come forward," he said. "Additionally I would like to thank the local community for their patience while inquiries are carried out."